Are you a handpan player who wants to record himself at home or in a studio, or who needs amplification for busking or to play on stage? It is likely that the first decision you will have to make is which microphone to choose. I decided to co-write this article with Alexandre Chaigne, a very talented french sound engineer. He is currently working for the Paris National Opera as well as the Music Unit Studio in Paris. Alexandre is very familiar with the handpan and how to produce its sound as he has recorded a number of albums for artists such as OLOJi, Twinpan and Laurent Sureau. The aim of this article is to show you the different types of microphones that are available, their advantages, disadvantages, and how well they adapt to the handpan. It’s almost impossible to state absolute truths, as each case is different. Every instrument is unique. Therefore, a suitable microphone for one handpan may not necessarily be appropriate for another. It all comes down to personal taste and, ultimately, only you can judge the sound quality that you are looking for. Nonetheless, here is what you need to know to help you choose your microphone. Not all microphones capture sound in the same way. A microphone’s directivity indicates how sensitive it is to sounds arriving at different angles within a space. It relates to the way in which the microphone ‘hears’ or ‘picks up’ the sound depending on the different directional options. There are 6 different patterns of directivity in microphones: Omnidirectional, Subcardiod, Cardiod, Hypercardiod, Shotgun, and Bi-Directional or figure of 8. Our advice: Microphones have either a fixed directivity or a directional selector. To start with, we would recommend the cardiod (or uni-directional) type of microphone for a wider range of use in a variety of settings. The most common type of microphone, renowned for its robustness and simple design. Advantages: It can take a high level of acoustic input without saturation (high gain before feedback). It is robust. Low risk of feedback. Disadvantages: Low sensitivity, meaning it has to be positioned close to the instrument. There is also an unnatural tone in the sound quality (although less so than with a static microphone). For my handpan? It will work well when playing in difficult conditions. The fact that it is not very sensitive will work in your favour by minimising unwanted sounds (e.g. audience noise) and reduce the risk of feedback. You are playing at the opening of a shopping centre. There are lots of people and a lot of noise. Let’s just say, it’s not the ideal gig. You are recording in a space with a lot of echo or unusual acoustics (e.g. a church).You are playing handpan in a rock band. You want to busk in the street. There are several types of static microphones that work using different technologies. There are those with small diaphragms (also known as condenser, electret or pencil mics), those with large diaphragms, and tube microphones. Advantages: Very sensitive, it can pick up all the subtleties and nuances of your playing, and can be placed further away from the instrument. It will stay true to the tonal qualities of your instrument. Disadvantages: It is fragile and can quickly be saturated by sound. It also requires an additional 48V cable or ‘Phantom power’ (except the tube mic which has its own cable). If used on stage it can be sensitive to feedback. Unlike the dynamic microphone, it is incredibly sensitive to sounds made whilst handling it. Don’t use it on stage to shout out to the crowd “Are you ready?! !”, for example. For my handpan? It will work well for sound recording at home or in the studio, as well as for playing a set on stage. It will faithfully reproduce the tone, subtleties and harmonics, etc of your handpan. If you generally play solo or as a duo on stage at festivals. For your own recordings at home. The technology used in a ribbon microphone closely resembles that of the dynamic microphone. The main difference is the presence of a thin metal ribbon instead of a moving coil. This ribbon, suspended between two magnets, vibrates in response to soundwaves. Advantages: A softer, more natural sound is produced because the response curve of the microphone is less acute. Disadvantages: It is fragile, sensitive to moisture, and therefore most often found in recording studios. It has a low output capacity, and so requires a resistant preamplifier. BE AWARE: Most ribbon microphones can’t withstand a phantom power supply. You can damage it just by switching it on. For my handpan? Use for studio recording. This will allow you reproduce the true sound quality of your handpan. This is a good microphone to test in a studio setting, because it generates a different tonal quality to that of a static microphone. You will often find them used as ‘overheads’ or in guitar amps but, once again, try them out and judge for yourself. These are microphones that stick directly onto the instrument and pick up the sound produced by the vibration of the instrument itself, hence the term ‘contact’. Advantages: Good for use with a PA or sound system as it cuts out the problem of feedback. Unlike a static microphone, it will isolate your handpan from surrounding noise. Disadvantages: The sound that comes out will distinctly ‘dampen’ the tone of your handpan, as it actually picks up the sound from inside the 2 shells of the instrument. For this reason, it is often paired with a dynamic or static microphone. Please note that it will almost certainly require balancing/ equalizing (EQ). For my handpan? It will be useful if you are playing on stage in a group and want to be distinctly heard amongst the other instruments. It also lets the bass frequencies come through more, which can be a good thing if you have a more percussive style of playing. You are playing on stage with other musicians and it’s difficult to hear you play. 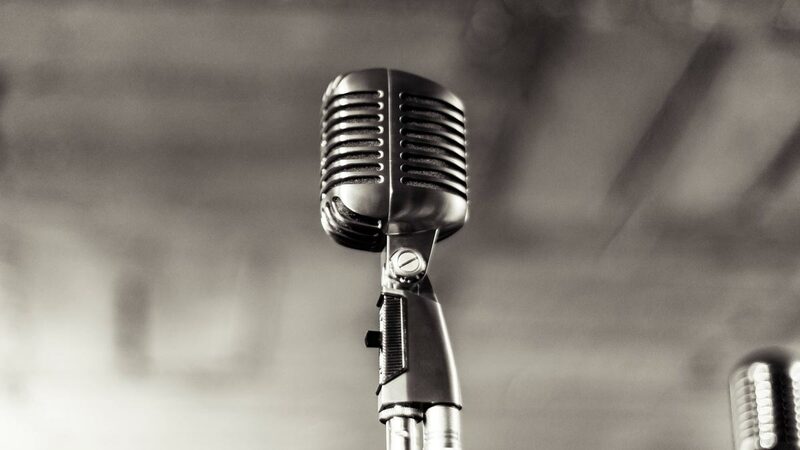 Microphone choice is a matter of personal taste, preferences, on-stage conditions, and availability of equipment. There are many good options, depending on the environment you feel you will most often be playing in. Here, to finish, is a short quiz to help you find the right microphone for the right situation. You have been asked to play a solo set for ‘Handpan Festival France’, which microphone should you use? Answer: Static. Your playing style is predominantly percussive and you like to use your fist when playing, which microphone should you choose? Answer: A contact microphone or a dynamic microphone positioned underneath the instrument. You play in a duo alongside harp, tabla, didgeridoo or guitar and are on-stage. What kind of microphone would you request for your handpan? Answer: Static or dynamic. You have been asked to play on stage by Megadeth or Metallica. You are put next to Lars Ulrich. You want to be heard, so which microphone do you go for? Answer: Dynamic + contact. You are at home or in the studio and want to record one of your own compositions. What type of microphone will do the job? Answer: All types can be used, unless you live in a cave (in which case the static or ribbon microphone would be difficult to use). You can control the conditions you play in and the sound you want to hear. Test some out, combine different mics, and go with what your ear decides is best. We hope this review has helped you feel better-equipped to decide on which microphone to buy in the future. Remember to ask other musicians for their advice, too. Watch videos and go to recording studios to ask the sound engineer. The way a handpan sounds is a vast subject of discussion and debate that continues to intrigue and challenge sound engineers. And, finally, which microphone do you like? What do you use it for? Leave us a comment and share your experiences! Disclosure: Please note that some of the links in this article are affiliate links, and at no additional cost to you, I will earn a commission if you decide to make a purchase after clicking through the link. Please understand that I have experienced this company, and I recommend it because they are helpful and useful, not because of the small commissions I make if you decide to buy something through these links.